An arrest was made Thursday in the vicious attack on Bob, a 42-pound (19-kilogram) pet tortoise who was slashed and stabbed after being stolen from the home of an autistic boy. Police said the attacker tried to cut Bob out of his shell. His hind legs were badly cut, his neck was slashed and his shell was punctured. He also was thrown against a wall. Jose "Tony" Mosqueda, 18, was booked for investigation of cruelty to animals and grand theft. "It's a good feeling. It's kind of neat," Sgt. Jack Richards said. "It just really pulled at some heartstrings, and it's good to have someone in custody." Witnesses to the torture provided information that helped lead to the arrest, Richards said. The 25-year-old tortoise is a special friend to Dorothy and Bill Sullivan's 6-year-old autistic son, who rarely spoke to people but chattered to the animal. 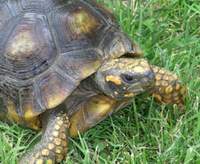 The tortoise was snatched from their yard on July 7, brutalized and dumped in brush behind an apartment complex. An anonymous caller told the family where to find him. Police declined to discuss a motive, but Richards said it did not appear the attacker wanted to eat Bob. The owner of Turtle Dreams, a rehabilitation center, has said Bob's chances of recovery are good. On Thursday, he was still being fed through a tube. Police advised the Sullivans of the arrest. "They were just very thankful," Detective Sgt. Rick Murray said.